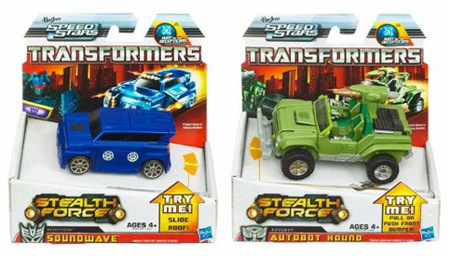 Speed Stars Transformers are Autobot vehicles that change from high speed race vehicle to a toy battle platform. The roof slides open to reveal the systems that take out the opponent. When the situation is resolved, the top retracts and the vehicle enters into stealth mode again. This gives your Transformers the abilility to merge in with regular vehicle traffic, revealing themselves only when required. The general population need not know that Autobot capability is there, but it is there to protect against the Decepticons.